Wikimedia Foundation has finally released a Wikipedia mobile application for the iPhone. Its main focus is to provide an app that is very fast and very simple. I've downloaded and tested Wikipedia mobile on my iPhone 3G yesterday and I must say that it still lacks the many features that I want. 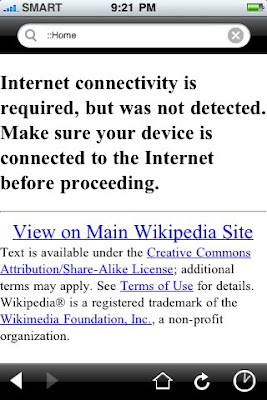 Like, I still can't save or bookmark my favorite pages, edit pages, and read Wikipedia offline. In fairness, Wikipedia mobile has an intuitive interface and reliable search engine. The texts are easy to read and the images are properly loaded. The Foundation has promised that more features will be added soon upon requests. Using its search box, you will always get what you are looking for. 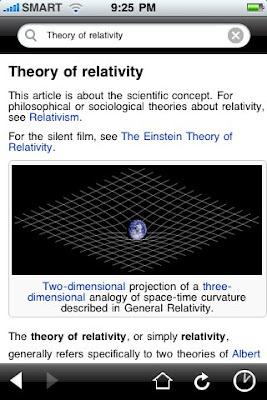 For those of you who have an iPhone or iPod Touch, I recommend that you download and try Wikipedia mobile. It's free and you can always delete it if it's not for you. In addition, its code is 100% open source and any programmer who is good at JS/HTML is encouraged to contribute.